At a meeting with fans around fifteen years ago, Dermot Desmond showed his steel. He told a group of supporter reps that his personal wealth would never be used to bankroll the club, because for all he loves Celtic business is not to be confused with anything else. “I might as well take my cash to my back garden and burn it,” he said of suggestions he might play the sugar-daddy. I have always been glad that he felt that way. I never wanted Celtic to be the plaything of some rich man. I am proud that we live within our means. I am also glad that the man who leads the strategy at our club has not got a sentimental bone in his body. He is ruthless and driven. He gets what we are, but also what we could become. He pushed out the boat for Rodgers because Rodgers was the best man out there. His decision was vindicated in honours and in the revenues which peaked at £100 million last year. Dermot Desmond was just as relentless at the meeting with Rodgers and Lawwell earlier on in the campaign, where he reminded the manager that he was the highest paid boss in the history of the club. “Time to start acting like it,” he said, and that may have piqued Rodgers and wounded his ego, but Desmond was making it clear who runs the show. There’s a lot of sentimentality doing the rounds today, and I find myself entirely unmoved by it. We stand on the brink of more history, and amidst the contentment is a growing feeling that perhaps we owe Lennon something. In my view we have already delivered it, and more. His career might have been severely impacted by his departure from Hibs; Celtic has given it back to him. If he signs off at the end of the campaign, he’ll do it with a double. The debt will have been paid, and then some. The last thing our club wants to do at the moment is get to a place where it feels a sense of obligation. We are under none. We have to do what’s right for the club itself, whatever that means. My counter to that was simple; if the board did such a search Lennon’s name wouldn’t even be in the running, not in a million years. Nothing I saw yesterday has contradicted that view. Indeed, I said in one of my earliest articles that even if he delivers the two trophies nothing will change my mind. I didn’t want Lennon the first time, and I don’t want him this time. Those who allege that it’s personal are pure fools. I should not have to keep repeating this but still do; I love Lennon the Man. But I can separate him from Lennon the Manager, and I’m not alone. No matter how many media outlets back him for the job, no matter how many ex-players – and I mean, who cares what Craig Beattie thinks? – or even current ones, think he should get it a lot of fans have grave doubts and they will not be shifted. If the board is serious about appointing the best possible manager it will not be Neil Lennon, and it’s a simple as that. 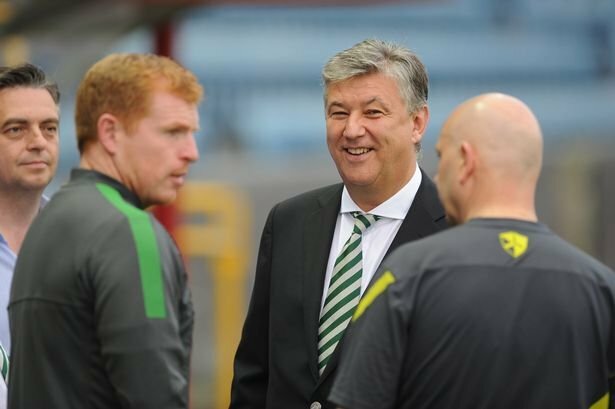 I have yet to hear anyone argue convincingly that a man whose career since leaving the job the last time was at Bolton and Hibs – and neither ended well – is best placed to fill the shoes of Brendan Rodgers. It does stand up to scrutiny. Whatever my views on Rodgers the Man – the complete, polar opposite of my view on Lennon; the word contempt is not strong enough to adequately convey it – I have nothing but respect for his skills in the dugout and on the training pitch. If a like for like replacement is not possible then I want a standard as close to Rodgers as we can get. The people running our club are not stupid. They know that the next managerial appointment will carry with it a message about our future and our future direction. If they take their own responsibilities seriously they will reach as high as they can. They will do a real search. They will look at other names, and they will keep on driving forward until they get the man they’re after. Or they won’t. And that will carry a message every bit as clear as the appointment of Rodgers did. In those circumstances they will do no search at all. They will give it to the man who has it at the moment, and to own that decision and try to sell it. They will not be able to say that they went looking for the best and that Lennon is what they came back with, so I doubt they’ll even try that on us. What’s more likely is that they will come back at us with all this nonsense about how Lennon “gets it” and understands the club, and when they do you’ll know to be concerned, because none of that should be part of the criteria for a serious board of directors. They’ll have shown that there’s no longer the ambition to drive us forward. And perhaps Desmond will, finally, have bowed to sentiment, or at the very least he’ll be using it against us and tugging on the heart strings to avoid the scrutiny that decision will deserve.